Mega Christmas Contest DVD Bundle – Winner Announced! Have we got a Christmas present for you! Thanks to the fine folks at Walt Disney Home Entertainment, we’re celebrating the re-launch of Animated Views with this gift of a contest! 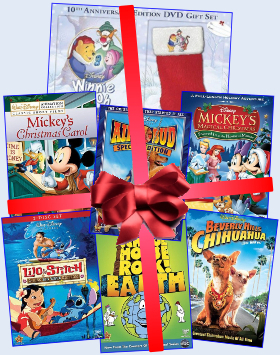 Up for grabs is a real Santa’s sack of DVD goodies worth almost $200, including something for everyone, from family comedies to animated adventure, plus a seasonal sprinkling of festive fun with your favorite Disney characters of course! Includes two new-to-DVD Pooh episodes plus Christmas stocking! Also includes Don Bluth’s heartwarming The Small One featurette! Featuring 35 Disney characters in four classic holiday stories! The original movie with new Dog-U-Commentary with the Buddies! Eleven new songs and animation as the Schoolhouse goes green! Featuring the bonus animated short Legend Of The Chihuahua! With extensive supplements including new feature-length documentary! Congratulations – your DVD pack is on its way! Thanks to everyone who entered our Christmas Contest, and we wish you a very Merry Christmas from all of us here at Animated Views! THE SMALL PRINT: Winning names will be drawn at random. Participants must provide a full name, mailing address and valid email contact. This information will be kept confidential and deleted after the contest has closed, although Animated Views withholds the right to publish winning names and location area only. One entry per household. Discs are Region 1 editions, and will only be shipped to a United States address. Prizes are non-transferable and no cash alternative will be offered. No responsibility is accepted for inaccurate prize descriptions provided to us at the time we go to press. The administrator’s decision is final and no correspondence will be entered into. Associates of Animated Views and Walt Disney Studios Home Entertainment are unfortunately ineligible to enter. The contest closes on Monday, November 30, 2009 at 11:59pm ET.